How do I buy a Kono Pizza Franchise? 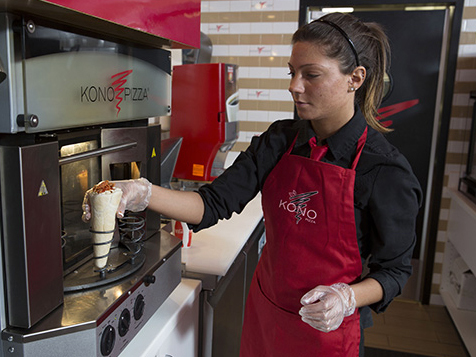 The Kono Pizza concept was first presented in Milan, Italy in April of 2004. Since then, the idea of mobile, authentic, high-quality Italian pizza has quickly spread to 130 franchise locations across 20 countries. Now Kono is ready to provide Americans with one of their favorite foods, made better! Whether you want to own just one location or build an empire like our Roman ancestors, Kono Pizza has a variety of business models available for our Famiglia to choose from. You choose how large or simple they want their business to be. From semi-permanent locations in Malls, to food trucks, to food carts in professional sports stadiums, it’s up to you! Open Kono Pizza in any of these available states: AL, AK, AZ, AR, CO, CT, DE, FL, GA, HI, ID, IL, IN, IA, KS, KY, LA, ME, MD, MA, MI, MN, MS, MO, MT, NE, NV, NH, NJ, NM, NY, NC, ND, OH, OK, OR, PA, RI, SC, SD, TN, TX, UT, VT, VA, WA, WV, WI, WY, DC. 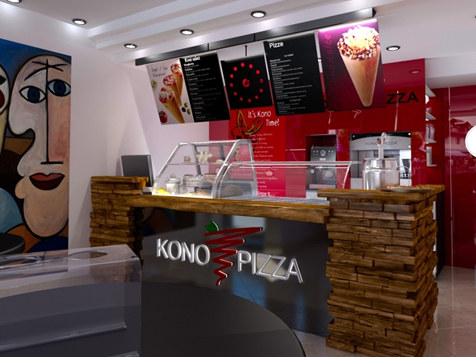 Kono Founder Carlo Ruggiero, an Italian Transplant in the United States, discovered the Kono concept during a family trip to Europe, and instantly recognized the opportunity to shake up the U.S. pizza market. After bringing the idea to his savvy U.S. entrepreneur partner David Ragosa, the duo struck a deal to bring the Kono concept to the United States. Now, there are already 15 konocations in development, with Kono USA now in "Andiamo!" (Let's go!) mode! REAL INGREDIENTS: No frozen cheeses, low-quality proteins or cheap produce. For Kono customers, quality always comes first. EAT ON THE GO: There is no “busier” nation than the United States. We are always on the move, and demand products to support our busy lifestyles. Kono pizza allows our customers to enjoy a delicious meal, on the fly. You just eat it the same way you would an ice cream cone—but, you know, with biting instead of licking. EASY, CLEAN EATING: Most people love pizza, but they also have a list of things they don’t love about it. “Oil running off the slice onto my clothes”, “the sauce insisting its way onto my cheeks” and other rants are common among pizza lovers. Not at Kono. Our Kono Cone was engineered to ensure that all of the product ended up where it’s supposed to, not on your shirt or on your face! Consumers are expected to become even more health-conscious as more studies on obesity and the dangers of eating an unbalanced diet continue to populate the media, PMQ reports. 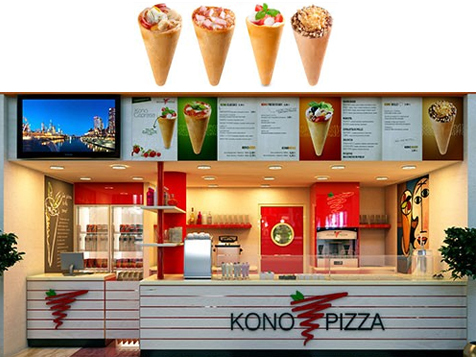 Each Kono location serves breakfast, lunch, dinner and dessert cones that incorporate healthy alternatives into several menu items. There are a total of seven low-calorie cones on the menu, and they are visibly identified as being low-calorie so consumers know that they are making a nutritious choice. GET OUR FREE PIZZA INDUSTRY REPORT! Ready to get started? Just fill out the form and a famiglia member will contact you, say ciao and see if we might make a great fit. We’ll answer all your questions and hopefully get you started on a great new adventure! 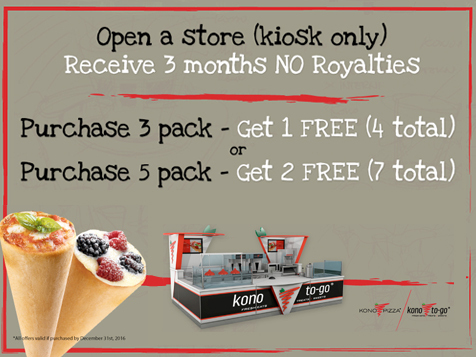 Open a Kono Pizza kiosk and receive 3 months NO Royalities! Kono Pizza is not currently active in our directory, but here are some other recommended selections for you to explore.